FBI arrests Joey Meek friend of Charleston church shooter Dylann Roof. 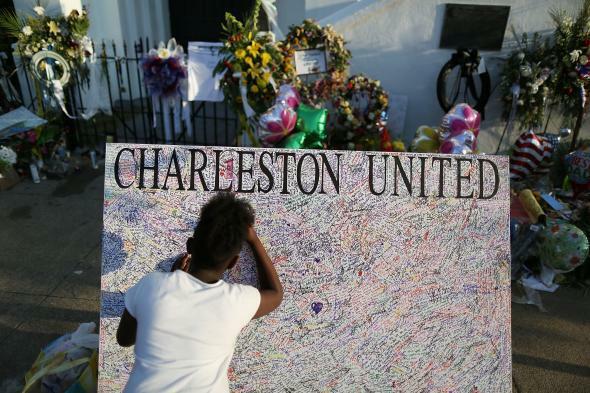 Mourners write on a message board in front of the Emanuel African Methodist Episcopal Church after the mass shooting at the church killed nine people. A friend of alleged Charleston shooter Dylann Roof was arrested by the FBI on Thursday six weeks after federal officials informed Joseph Meek he was a “potential target” of a criminal investigation for his relationship with Roof before the mass shooting and his statements to police during the investigation of the massacre of nine balck members of Emanuel AME Church. The letter [from the U.S. Attorney’s Office] stated that Meek was under investigation for possible misprision and allegedly making false statements to law enforcement. Both crimes are felonies. Misprision, which means the concealment of knowledge about a crime from authorities, carries a maximum sentence of three years in prison. Making false statements carries a maximum prison sentence of five years, though that number rises to eight years when the false statements concern certain types of crimes, including international or domestic terrorism. Meek told The Associated Press that Roof had drunkenly complained that “blacks were taking over the world” and “someone needed to do something about it for the white race…” [and] that Roof said he used birthday money from his parents to buy a .45-caliber Glock semi-automatic handgun, which Meek took away from him the night of his drunken rant but gave back to him when Roof had sobered up. Meek also said he called authorities after recognizing Roof from surveillance footage from the church. But, according to a federal law enforcement official, authorities believe Meek was dishonest with them during their investigation.